Princess DVG cutting digital files suitable for Silhouette Cameo, Portrait, Curio, Cricut with gold, purple crown. ∞ Print as many as you want for personal use and commercial use (with credit to our shop up to 1000 units). Size: Princess is 7" high, 300 dpi (for professional printing) in JPEG/PNG format. The rest is smaller. File Format: SVG,EPS,PNG (transparent background), JPEG. 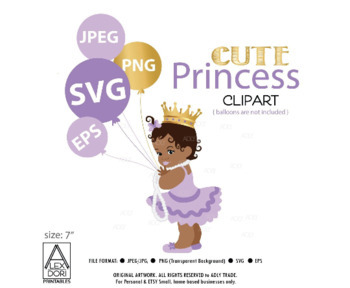 Our digital baby princess clipart is perfect to use in scrapbooks, baby shower, nursery decor, animal collectible printouts and many more! Can be used for baby shower decoration, birthday! After the purchase, you will only need to download the digital files, print them out, and use them in any way you like. For extended commercial use beyond our standard policy please contact us by the message.